SpokePOV mounted in fan « Adafruit Industries – Makers, hackers, artists, designers and engineers! 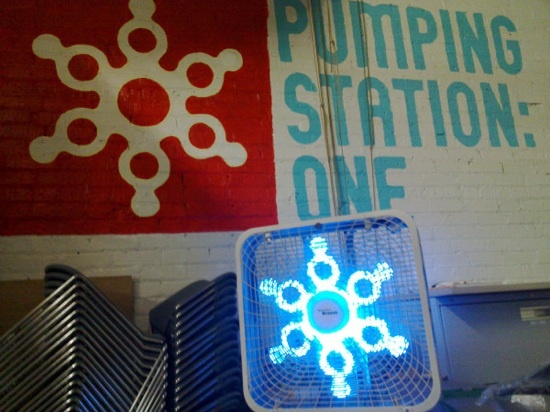 What did I spy at my hackerspace, Pumping Station: One, in Chicago at our weekly meeting last night? Nothing other than a blue SpokePOV kit mounted in a box fan lookin’ all awesome! Our most excellent member, Crimson, decided to take the SpokePOV from one wheel of the our TRON lifecycle (made for the Scion Hackerspace Challenge). He removed the fan blades since it was 5 bladed instead of 3 blades. Then he cut out of plywood a new 3 legged propeller and attached the 3 SpokePOV boards with zip ties. The magnet is affixed to the fan grill and the hall effect sensors detect it well.